When you need replacement gutters, you may want to consider a system attached with gutter hangers. Traditionally, guttering has been attached using nails or screws driven through both sides of the gutters into the fascia or roofline. This can create a route for water to follow, slowly corroding away gutters and seeping into wood. Gutter hangers solve this by supporting gutters from the outside, without penetrating their walls, allowing water to be directed away from your home without stops along the way. As the leading source for high-quality exterior home improvement products in New York’s Capital region, Huff ‘N Puff doesn’t just offer gutter hangers; we offer the best on the market – Snaplock. With Snaplock, not even your hangers are nailed into your home, but rather clipped into a specially designed bracket along your roofline. 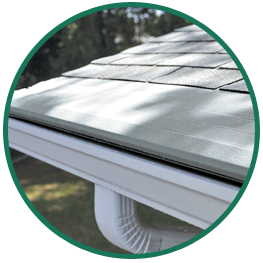 When combined with our high-quality seamless aluminum gutters and a Gutter Helmet gutter protector, these gutter hangers allow Huff ‘N Puff to create a gutter system that provides unrivaled protection to your home while never requiring maintenance. For more information on how Huff ‘N Puff can help you refresh your home gutters in the Hudson Valley and Capital Region, call us at (855) 483-3678 today. In addition to gutter hangers, we also offer replacement home windows and gliding patio doors. By clicking below, I ask that Huff 'N Puff call me so I can learn more about its products. Copyright © 2018 Huff 'N Puff | 110 Rotterdam Corporate Park - Schenectady, NY 12306 | Disclaimer Huff 'N Puff (Renewal by Andersen of Albany and the Hudson Valley) is an independently owned and operated retailer. "Renewal by Andersen" "Gutter Helmet Info" and all other marks where denoted are registered trademarks of Andersen Corporation.